Discover the dramatic river-carved bluff lands while biking in and around southeastern Minnesota’s Root River Trail Towns. Along the trail from Harmony to Preston, Fountain, Lanesboro, Whalan, Peterson, Rushford, and Houston you will find the perfect place for a biking vacation or long weekend adventure. Riding out of Peterson, MN (one of the Root River Trail Towns) some young kids bike with grandma and grandpa on the Root River bike trail in Southeast Minnesota. While exploring Bluff Country you can enjoy local artisans, historical architecture, and museums while sampling the locally sourced cuisine influenced by the Amish and Scandinavian cultures. In a nearly mosquito free environment, watch eagles soar above as you pedal the paved trail that parallels the lazy winding trout-filled Root River. Several bike friendly road routes will take you in and out of the bluffs, where you will see red foxes, wild turkeys, and deer that will watch you through the wooded landscape as you pass by. Explore and enjoy the beauty of the bluff country landscape in and around the Root River Valley. 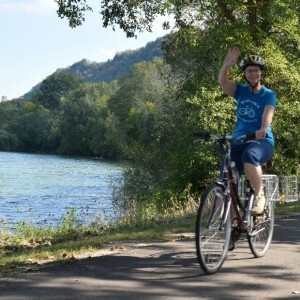 Offering over 60 miles of paved trails that connect the Root River Trail Towns, it also offers many scenic road routes for touring the bluffs. For the mountain bikers, there are opportunities for varying terrain through state forests and on quite gravel roads in both Fillmore and Houston Counties. The trail and the towns along the trail offer many opportunities beyond biking. 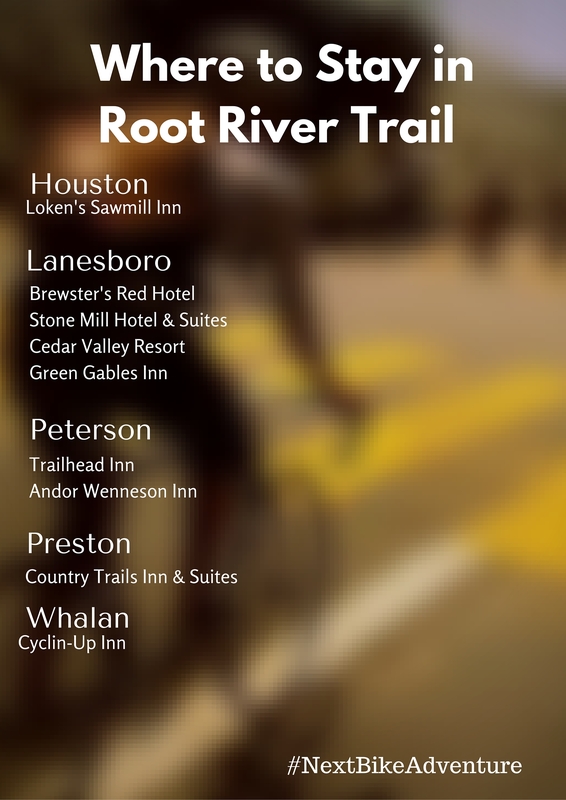 Check the descriptions below for some of the attractions for each town on the trail. 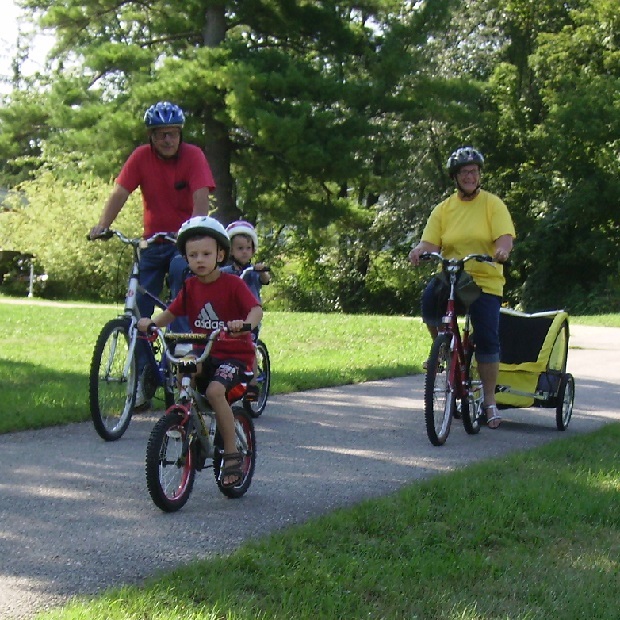 Each of the communities along the Root River Trails offer a variety of options to choose from to feed your appetite. There are a number of delightful discoveries waiting for you when visiting Harmony. At the south end of the Root River Trails system you will find a small town atmosphere that truly stands behind its name. Home of the Niagara Cave, it is a place to explore when not riding. Here, you will find plenty of dining and lodging opportunities. Visit Harmony’s Hobo Park. It is a sculptural project and is a series of hobo figures at the trailhead in town titled “Life Along the Rails.” Harmony offers several interesting bar & grills, cafes, and delis ideally suited to a bicycler’s interest. For the most up to date listing visit here. Here are some more things Harmony has to offer. Riding your bicycling to one of the next Root River Trail Towns, Preston is the next Trail Town, 12.3 miles of gently rolling terrain. The Fillmore county seat this community as vibrant and at the heart of bluff country. Many visit Preston to view the beautiful Root River Valley and access the miles of paved bike trails and quite country roads in and around the area. Also known as “Minnesota’s Trout Capital” and Home of the National Trout Center, Preston is a welcoming family-fun destination offering visitors many choices for both dining and lodging. Preston offers a deli at the local grocery store specially suited for a picnic and there are several cafés ideally suited to a bicycler’s interest. Preston has several B & B’s along with charming and interesting motels. The Preston Public Library is located at 101 Saint Paul St. S.W., Preston, MN 55965 and can be called at 507-765-4511. For great pictures, check out this hashtag: #PrestonMN. Here are few options for the Preston area. Riding your bicycling to one of the next Root River Trail Towns, here it is 12 miles to Fountain, and 10.2 miles to Lanesboro. The trailhead in Fountain is located at the top of the bluff, just off Highway 52. At the trail head, you will find picnic shelters, playground and a volleyball court, and places to eat in the downtown area. Fountain has a grocery store with great snacks and deli items for a picnic and a couple restaurants ideally suited to a bicycler’s taste. For the most up to date listing check here There is also a hardware store in the downtown area for minor repairs, sunscreen, etc. Here are a few of the features of Fountain. Riding your bicycling to one of the next Root River Trail Towns, here it is 11.2 miles to Lanesboro, the next Trail Town. Nestled in a deep valley of the Root River, Lanesboro offers visitors here many invigorating outdoor activities, rich artistic experiences, unique shopping, a local winery, fine dining, and lodging to fit every taste and budget. Here at the center of the paved Root River Trail system you will find a downtown area revitalized with many shops, restaurants, and the Common Wealth Theatre for your visit. Lanesboro offers several interesting and charming coffee shops and cafés ideally suited to a bicycler’s interest. 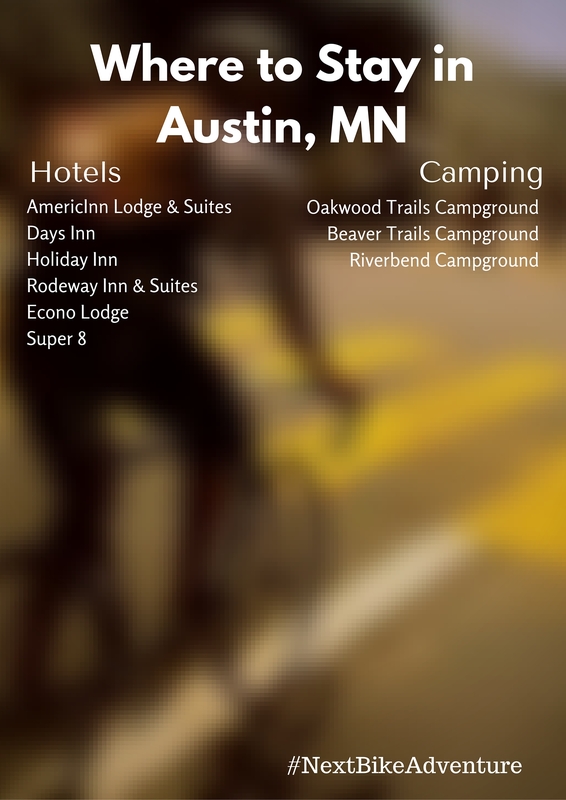 Lanesboro has several B & B’s and camping options along with a couple charming hotels. The Lanesboro Public Library is located at 202 Parkway Ave. S., Lanesboro, MN 55949 and can be contacted by 507-467-2649. Here are a few of your options in Lanesboro. Riding your bicycling to one of the next Root River Trail Towns, here it is 4.6 miles to Whalan, the next Trail Town. A charming 19th century Irish village in a valley surrounded by limestone bluffs and lush green hills, the village here was incorporated in 1876 with land donated by John Whalan. Soon after a railroad was built with a train depot here along the rail line, now the Root River Trail, it moved people, cattle, crops, lumber, and general supplies from city to city along the tracks, then on to La Crosse. Today, you will find a great place to stay and a pie shop for desert. Both are along the trail in Whalan. Riding your bicycling to one of the next Root River Trail Towns, here it is 8.9 miles to Peterson, the next Trail Town. Surrounded by bluffs and farmland, you will find the friendly Norwegian community of Peterson. 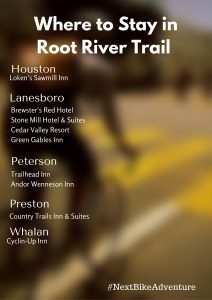 As the Root River Trail crosses the city’s main street you will see all kinds of options for a visit. First, you will notice the local café, known for their delicious breakfast, lunch, and afternoon desserts. Further down the street, at the ice cream shop, you can rent a kayak or tube to cool off on those hot summer days. Or, take a break at the Peterson Station Museum/Visitor Center where one of the exhibits, a vintage John Deere Bicycle, is showcased along with the towns lengthy history starting in 1855. Peterson offers a great ice cream shop and a charming café ideally suited to a bicyclist’s taste. Here you will find several B & B’s along with full service city campground. Here are some of the attractions in Peterson. Riding your bicycling to one of the next Root River Trail Towns, here it is 4.8 miles to Rushford, the next Trail Town. When you arrive in Rushford on the Root River State Trail the first landmark you’ll encounter is the original 1867 Railroad Depot. This Historic Depot and Visitor’s Center, on the National Register, is a great place to stop and step back into the wonderful history of early Rushford. Then, cruise around the downtown area and enjoy the great places to eat while staying or visiting here. From the deli at the local grocery store, to a picnic, to several restaurants, Rushford offers several interesting and charming places to eat. Rushford has a couple B & B’s, a new motel, and the City’s campgrounds. The Rushford Public Library is located at 101 North Mill St., in Rushford, Minnesota. They can be contacted at 507-864-7600. Here are a few more of Rushford’s options. Riding your bicycling to one of the next Root River Trail Towns, here it is 12.6 miles to Houston, the next Trail Town. Boastings one of the best trailheads in the state of Minnesota. Here you will find the Houston Nature Center, a band-shell, natural playground, recycled bike art, and walk-in campsites. At the eastern end of the area’s Root River Trail you can take a walk or bike ride into the downtown area to visit the shops and popular restaurants in Houston. For the most up to date listing of restaurants check here. Houston has several lodging opportunities and a campground. Along with most hotels, coffee shops, and restaurants having Wi-Fi availability, the public library is another good option. The Houston Public Library is located at 202 East Cedar Houston, MN 55943 and can be reached by telephone at 507-896-7323. Here are just a few options for you to choose from. Riding your bicycling West on the Root River Trail from here, it is 12.6 miles to Rushford, 31.1 miles to Lanesboro and 63.6 miles to Harmony. This entry was posted on June 5, 2016 by Russ Lowthian.